Mark Thomas and his spouse Kathryn have been together since 2012 and have an adorable four-year-old daughter together. The two lovebirds recently got married. After the big day, Mark asked another person to marry him too and it’s about the cutest thing ever. Their daughter Evelyn was thrilled about her parents’ wedding, and she figured that it was kind of her special day too. Mark and Kathryn absolutely agreed that their wedding day would be as much about themselves as it would be about their adorable daughter. When the wedding date started to approach, Evelyn became more and more thrilled about “her big day.” The couple encouraged her to keep telling everyone that it would be her special day too. The newlyweds had a wonderful time, but Evelyn still had one small question to ask. She wondered why she didn’t get a ring too, like mommy. Mark immediately knew that he needed to make things right. He went to the jeweler’s store to buy a special ring for Evelyn as well. Of course, popping the question is a part of the experience, so dad went down on his knees and adorably asked his daughter to marry him. “You know Mommy and Daddy got married and we’re a family now, me, you and Mommy. Well, Mommy and Daddy have got rings, haven’t we? Mommy’s got two rings,” he told her. After a bit of a pause, Mark looked into his daughter’s eyes and asked a simple question. “Will you marry me?” he said while presenting the ring to her. You can see Evelyn’s eyes sparkle the second she sees the ring. Of course, she said yes! The smile on both of their faces really speaks more than a thousand words. Mark asked her if he could put the ring on her finger and the two immediately gave each other a big and warm hug. 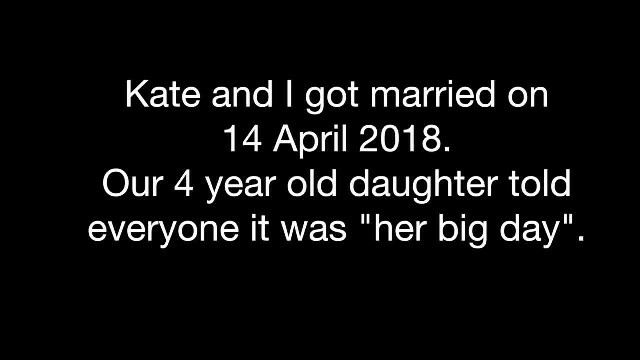 “My 4 year old daughter told everyone that mine and her mum’s wedding was “her big day”, so I bought her a ring and proposed to her properly. I’ll never forget this <3″, Mark wrote on Twitter. “Well Evelyn said yes and hugged me. I have to say, that was a pretty awesome feeling,” the proud father added. Mark recalls telling his Twitter followers about his plan, and they persuaded him to film the whole thing. The video is an absolute joy to watch and it’s just so incredibly cute to see the reactions on their faces.